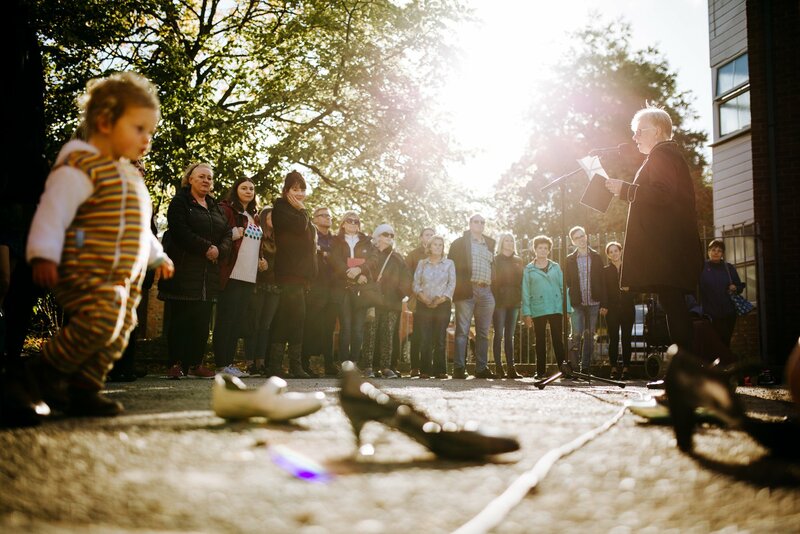 Today is National Poetry Day – in celebration we caught up with Louise Wallwein MBE, writer of Home Town Story, our commission for this year’s BBC Contains Strong Language, to ask her about the inspiration for her poem and why she thinks it resonated so much with the audience. The trigger for the poem was the day I found a plaque in Queens Gardens in Hull that features a quote from Robinson Crusoe, “If I could return to Hull I would return a happy man.” It resonated with me as I always feel so happy when I return to Hull because of the welcome I receive and the great time I have with the audience, who love poetry. The poem calls for a return of a young man. I was inspired by my many returns to Hull over the past two years whilst being one of the BBC Contains Strong Language Hull 17 and 18 poets. I used the journey itself to write the opening stanzas. Everything I noticed about the sky, nature and landscape on that beautiful train journey from Manchester to Hull. The main character is a boy called Jack. Tell us about him and his story? Jack is a lad who is finding his place in the world, he’s had to leave Hull, and wherever he has been he has felt stranded. Inspired loosely by Robinson Crusoe leaving Hull and becoming stranded on an island. In Jack’s story it’s not made totally clear, I left it open and only allude to where he might have been. It’s good to have a bit of mystery in a story so that the audience are kept compelled throughout. Jack may have been working in another city and felt isolated or may have been in the nick. Whichever way, because of the night he left he doesn’t know whether he can return or not. The poem and the other characters give you more clues as the journey progresses but are all calling for his return. Can you summarise Home Town Story in one line? A beautifully explosive landscape love poem to Hull. Local artists and poets were involved, tell us about this process? How did their experience feed into the story. I led a couple of workshops with Women of Words, a group of local writers, where we discussed a poem called My People by Kim Moore. They wrote poems in response to this, exploring the different things that inspires people. I curated the contribution of local Poet Russ Litten. I wanted to challenge him to act as I know Russ well from working with him at Arvon. There is something very warm and welcoming about Russ, he is like the city of Hull itself. When we showed Russ what we had done with the My people exercise he had a poem that fitted perfectly that he had already recorded with Steve Cobby. Talking to Russ about the character Jack and where he might have been, Russ had a poem called Arthur, written from his vast experience of working as a writer in Prisons. He changed it so it could fit with the story. I also asked Russ to be the one to speak my poem as I knew he would take it to a higher level with his work with Steve Cobby. Russ then collaborated with my poem to write the ending of the story and final poem. Home Town Story also featured Zena Edwards. Yes, then there is the wonderful Zena Edwards. I had a conversation with her before she went off and did her own research. We talked about what I had uncovered in my research at the History Centre and from talking to local people. From this Zena delivered this beautiful and vast poem and performance. We talked about all of the inventions from Hull, about our own experience of living in cities that are being regenerated and what that feels like. You worked with acclaimed Director Mark Murphy on Home Town Story. The poem and story was edited by Mark Murphy. He did a great job of pulling images out of the poem. For example taking slamming doors and turning them into central images. He was what every writer needs when presenting this type of work in the landscape, you don’t need too many words. Mark worked with the cast on the ending, which made many people cry, where the community come together to tell you about people they know. Home Town Story was a perfect collaboration everyone who worked on the show wrote it. I would also like to say a big thank you to Joe Hakim, he was my poet friend during the writing of Home Town Story, he fed me research, listened to my fears of doing a terrible job and reassured me. Again this reflects another thing I always get in Hull. Kindness and openness to discuss and debate everything. Home Town Story, was loved by the audience. Were you expecting the reaction that you got? I wasn’t expecting so many tears but this poem really connected with the audience, the collective memories of the city and difficulties which are still so close to the surface. I work in many cities but in Hull there are these collective memories that still impact the community today.